I have written about many annuals and perennials from summer trials last year. However, there are many other current varieties and 2018 introductions that need our attention. These specific plants were eye catchers in multiple trials. They demonstrated durability, heat tolerance, disease resistance, uniformity and floriferousness in all trials in which they were entered. This intermediate series (pictured above) has been in the marketplace for several years, and Pink Flirt and Snow Ball are new introductions for the 2018 season. The series now offers seven colors. I focused on Pink Flirt because it was in many trials last year and was in continuous color until early fall. This dark pink variety manifested the attributes we have seen in the entire series — outstanding upright branching, tight dense canopy and glabrous dark green foliage. The peduncles are short but rise above the plant to provide large florets, creating an exceptional flower canopy. This series matures at 18 to 24 inches with application in quarts, gallons and mixed containers. Many growers are using this series for quart production because of its uniformity and compact habit. Introduced in 2015, this vegetative series has gained increased attention because of its outstanding garden performance. The micro-blooming series is comprised of three colors: Coral, Pink and Lavender. Their flower canopy is exceptional with vivid color, and they bloomed from early May in Florida to late September in the north. The mature plants have glossy green foliage and a tight mounded habit with exceptional heat tolerance in full sun. The series has impressive durability and tremendous potential in landscape plantings and application in quarts, gallons and mixed containers. The series matures at 12 to 15 inches with a spread of 12 to 18 inches. More exciting colors are in the pipeline. This vegetative series is now comprised of three colors. I was impressed with Red, which was entered in multiple trials. This intricate crested flower head was unique and eye catching. The large 3- to 4-inch flowers were vibrant, uniquely textured and nonfading throughout the summer. The plants matured at 18 to 24 inches. This series complements the Intenz series and will be excellent for summer and fall programs. Its unique flower structure and deep red color creates the “wow” factor at retail. The Flamethrower series is comprised of five varieties for 2018. These are low-maintenance, high-impact colors with distinctive, narrow serrated leaves and unique multicolors that create textural eye catchers. The most outstanding color in the trials was Spiced Curry. This plant with nonfading chartreuse leaves and dark red splotches was stunning in summer trials, and I have seen it used in landscape beds with great success. 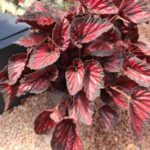 It is listed as a 12- to 18-inch coleus series; however, in trials and landscape beds 24 to 30 inches is more realistic. This is also an excellent filler and thriller series for mixed containers. 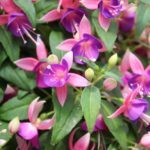 There are more than 115 species of cuphea, and we are all familiar with many of the llavea and hyssopifolia cultivars including the Flamenco and Vienco series. The new Floriglory series is comprised of seven hyssopifolia colors that exhibit attributes we are familiar with, including heat tolerance, clean lustrous foliage, and drought tolerance. How does the series differ from Purple Heather ‘Allyson’? The differences are significant, including increased vigor, wide color range, two plant types, larger flowers and most importantly a prolific flower canopy. This series was entered in multiple trials last summer in containers and beds, and performed exceptionally until frost. 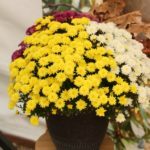 ‘Floriglory Diana’ is a 2018 All-America Selections ornamental vegetative winner. This series will stand the test of time and provide color for the consumer throughout the season. 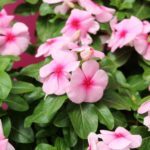 What comes to mind when I think about this interspecific impatiens series is heat tolerance, adaptability and color selection. Dümmen Orange entered this series in trials sites throughout the country following its 2015 launch and continued with a heavy presence in 2016 and 2017 trials. There are 16 colors and two mixes in the series. 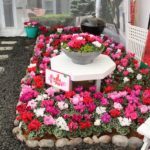 All colors were trialed over the past three years in containers, baskets and beds, in shade and sun, to demonstrate their versatility. They have been utilized in the industry in multiple applications including packs, quarts, baskets, mixed containers and landscape beds. They are as heat tolerant as any interspecific in the industry, and the uniformity, adaptability, floriferousness and resilience through the entire season have been impressive. There is a wide assortment of colors, and the five Aurora colors are distinctive with subtle bicolor iridescent flowers. I saw many outstanding lantanas last year as I traveled to trials throughout the United States, and I believe this lantana was the most vibrant true red. This is a sport of ‘Anne Marie’, discovered in 2005 and patented in 2015. It has a dwarf, clumping form, and the flower clusters start out as a warm mixture of yellow, orange and red. As the flowers mature they transition to a large, bright, vibrant red that is incomparable. ‘Ally Klaire’ grows to 24 to 30 inches in the ground and has outstanding application in quarts, mixed containers and landscape beds. This color really pops in the garden and on the retail shelf. This standalone lantana is part of the Southern Living Collection and was renamed ‘Firestorm’ for promotion at Home Depot in 2018. Liners are available at www.coachsnursery.com for summer sales. This interspecific series performs exceptionally year after year in summer trials and continues to impress with outstanding performance through late fall. It is considered the all-season petunia, and it has demonstrated all the qualities we look for in a series including disease resistance, flower vibrancy, vigor, weather recovery and floriferousness. There are very few plants that produce the flower power of the SuperCal series, and last year the new Buttercream was no exception. The flowers are white with yellow eye and were planted in the trials adjacent to ‘SuperCal Crimson Red’ to create dynamic color contrasts. The habit is semi-trailing. The rating of this new variety was at the top of the charts in all trial sites, and based on performance this series should be considered for all spring programs. 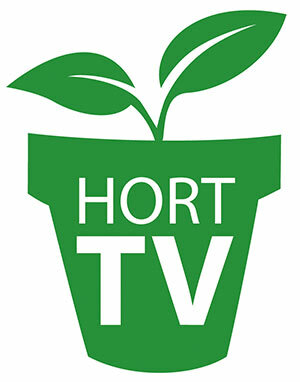 Growers have the choice of upright and trailing colors with application in quarts, mixed baskets and containers. This series has already proven itself and provides the consumer with an all-season performer. This series is new for 2018 and was entered in multiple trials last year. Performance was outstanding, especially Purple Vein. There are six colors available and, if all colors manifest the garden performance of Purple Vein, this will be an exceptional series. The flowers are lavender accented by dark purple veins. Purple Vein was extremely floriferous and non-fading in trials throughout the summer and fall. The Petunia choices are many, but this variety stood the test of time last summer. This is touted as a no-pinch, compact, early-blooming and uniform series. Additional colors include Pink Lace, White, Burgundy, Red and Indigo. This is the most vigorous series in the Ball FloraPlant portfolio, and it was impressive in summer trials in 2016 and 2017. Plants were utilized in production programs last year and will be in spring programs for 2018. Blue and Pink were introduced initially, followed up with Pink Vein for 2018. The series is vigorous and mounded, with matched habits, excellent color saturation and extreme floriferousness. In many trials, Pink was planted adjacent to Vista Bubblegum, considered one of the finest Petunias in the industry, to show the similarities. There were many, including vigor, heat tolerance, flower vibrancy and remarkable flower canopy. ‘ColorRush Pink’ was a darker pink in many trials. This series has excellent application in large containers, baskets and landscape beds. This interspecific vegetative phlox series was introduced in 2016 and trialed extensively throughout the United States the past two years. I have had the opportunity to evaluate the five colors in the trials and in wholesale and retail production programs. The colors in the series are stunning and vibrant, and garden performance is incomparable. This series demonstrates a full flower canopy with a uniform mounding habit maturing at 10 to 12 inches. Throughout the summer until early fall the plants were tidy, mildew resistant and floriferous. The series was utilized in quarts, gallons and mixed containers last season with exceptional results. 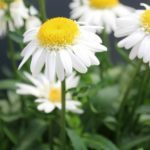 In the past we have questioned the vigor of these interspecific types, but this series has been trialed and has performed under extreme summer conditions. My favorite was Hot Pink, which flourished in every trial. We have seen many interspecific phlox introductions in the past few years, and this series, based on performance, has raised the bar. Next month I will continue with more all-star performers from last summer. Vaughn Fletcher is president of Fletcher Consulting. He has been in the horticulture industry since 1971, working in many areas including landscaping, garden center and greenhouse production, greenhouse and nursery sales and sales management. He can be reached at [email protected].